Aquaculture farmers manage the breeding, raising and harvesting of fish and shellfish for commercial purposes in marine or freshwater farms. Source: New Zealand Salmon Farmers Association and Sanford Ltd, 2018. Chances of getting a job as an aquaculture farmer are average due to low turnover and steady growth in aquaculture farms. Pay for aquaculture farmers varies depending on skills, experience, and the type of work they do. Aquaculture farmers with one to three years' experience usually earn between minimum wage and $60,000 a year. Aquaculture farmers with more than three years' experience, or in supervisory roles, usually earn between $50,000 and $80,000. Source: New Zealand Salmon Farmers Association, 2018; and Sanford Limited, 2018.
train, supervise, manage and assess staff. awareness of health and safety practices. Diving skills are also recommended. sometimes work in challenging weather conditions. The forces of nature mean that no day is the same for David Horton, who works as the skipper of a farming vessel. He says there is always something new to accomplish. "I love being out on the mussel farms. We start early and finish late, making the most of the weather and the work that has to be done. I have to think on my feet, with the responsibility of a vessel and crew to keep safe. "Working four days on, four days off means I can give it 100 percent for the days I’m on. It also gives me a great work-life balance with plenty of time for community, family and recreation." David is grateful for the development opportunities he has had through working in aquaculture. "One of my proudest moments was being promoted to skipper after I completed my training. The training did present some obstacles – I was not the greatest at school. But because this was really important to me I used all my knowledge, together with internal and external support, to overcome those obstacles." If you’re interested in a career in aquaculture, the right attitude is crucial, says David. "There are jobs and opportunities for everyone who wants them. If you have enthusiasm, drive and energy give it a go." Rowan: Hi, I’m Rowan Hook. I live in the Marlborough Sounds. I’m a keen diver, and I’ve got my dive certificate and my boat certificate. I’m just really keen to learn about the salmon industry. Clinton: That’s great news, because those are skills you can use as a shift worker on a salmon farm. Mark Preece is the sea farm manager for King Salmon, and he’ll be showing you around. So what makes a good apprentice? 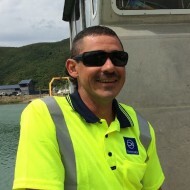 Mark: A good apprentice is someone who enjoys living in the great outdoors, working in the Marlborough Sounds – it’s absolutely beautiful out here. Someone who can get on well with a small team of people, and doesn’t mind staying away from home for a bit of time. Clinton: The farm is located 15 minutes out of Picton. Mark: Dip your feet in here, Rowan, to take off any bacteria or stuff that you might have come in contact with while you were on the land. Clinton: Each pontoon has four 20 by 20-metre nets that are filled with 30,000 fish per cage. That’s a lot of fish, so Rowan’s back out on a boat to do a quick check to see if any seals have broken into the farm. Seals are the wolves of the sea and the farm has a reinforced outer net to keep them out. Mark: Seals will eat probably five or six kilos of fish a day, so if you multiply that out over the year and they’ll probably take out about a tonne per seal, so that’s a lot of fish. Mark: Salmon farming is growing fish in the sea. What we do is we have brood stock down in our freshwater hatcheries, we strip the eggs from those brood stock, grow fry, then move the smolt to sea when they’re ready to come to sea, and feed them up once they’re in the sea. Mark: It’s really important with our fish feeding to make sure there’s absolutely no waste, so what we use is this sensor, we set it at five metres depth. The pellets fall through this hole, and they’re detected by the sensor. Clinton: The sensor readings are downloaded to computers so the salmon feed can be monitored. Mark: Farming fish is a bit more efficient than fishing for them. Basically, we can feed them and grow them a lot more efficiently than in the wild. Clinton: The fish are anaesthetised by Maurice to avoid stress during the weighing process. Rowan chucks on the dry suit so he can have a go. Mark: When you pick the fish up, Rowan, you just have to be really careful to keep your hands away from their eyes and their gill area. Rowan: So do they bite? Mark: Ah, no – they don’t bite, they’ve got little teeth so you’ll be right. Mark: That’s OK, let him go, you’re right. Next one. That’s it, nice and firm. Rowan: Ahh! It did bite me! Clinton: Rowan’s been working hard, so it’s time for a cuppa in the farm living quarters. It’s also a chance to catch up with apprentice Lisa. Rowan: So how long have you been working here? Lisa: I’ve been working here for five months now. Rowan: How much time do you get off? Lisa: We work seven days on and we stay in the barge, then we have seven days off. Clinton: Lisa lives in Dunedin and car pools with workmates from Christchurch once every two weeks. Mark: And then in your week off you get a chance to go away, catch up with friends, go for a snowboard – all those sorts of things. Things that people can’t do on a two-day weekend, you get to do every second week. Mark: Well Rowan, it’s good you’ve got your dive ticket. We’re going to hop in the water and have a bit of search round, see if we can find any holes. If we find any, we’ll repair them. Rowan: Cool. That sounds great, let’s go! Mark: Basically the whole farming operation is under water, so we need to get down there and have a look at it. Rowan: Wow that was amazing! They were all swimming and the bubbles were going in circles, it was neat! Clinton: Get dry quickly Rowan because there’s more work to do. Clinton: In order to maintain the nets they have to be lifted up and the fish transferred to another pen. Once that is done they can be patched and then cleaned with a high pressure water blaster. Mark: What you’ve got to do is you’ve got to walk out on the net. You want to be careful and get your balance right. Rowan: Will this hold me? Mark: Yeah! It’ll definitely hold you! Mark: Yeah easily! Just out in the middle there you might get wet feet…Nah just joking! You’ll be fine. Rowan: I am in the water! You lied to me! Can I have a go? Mark: Yeah, get into it! Clinton: Cleaning helps water flow and extends the life of the nets. Mark: Hey, Rowan! That looks good! Rowan: That’s one high-powered water blaster! Mark: A bit damp in there on the feet? Mark: Probably should have given you some gumboots eh! Clinton: He’s come to the end of the experience, so has Rowan got what it takes? Mark: I think Rowan went pretty well. He’s pretty keen and he’s got a few skills there, and if he’s keen to apply himself then I think he’ll do really well. Rowan: My favourite part of the experience was diving with Mark in the salmon cage, and sitting on the bottom and looking up and seeing all the fish circling above us. It was pretty good. Clinton: Salmon farm workers can gain a National Certificate in Aquaculture by completing unit standards while working. Dive training is also done on the job. Shift workers typically start on $29,000 and move into other aquaculture jobs like marine farm management or supervisory roles later. The marine farming sector is worth around $250 million a year, with over 1,000 farms throughout New Zealand. There are no specific requirements to become an aquaculture farmer. However, an aquaculture qualification, such as a National Certificate in Aquaculture, may be useful. Managers or supervisors working on boats need to have a skipper restricted limits (SRL) certificate (Maritime New Zealand's licence to operate as a captain/skipper). A diving qualification may also be required on some farms. There are no specific secondary education requirements to become an aquaculture farmer. However, biology, English and maths may be useful. Aquaculture farmers, especially mussel farmers, must be reasonably fit and strong as the job can involve heavy lifting. They also need to be comfortable working on water. Aquaculture farmers who work as skippers should also have normal colour vision to meet Maritime New Zealand requirements. growth in the number of aquaculture farms is steady. 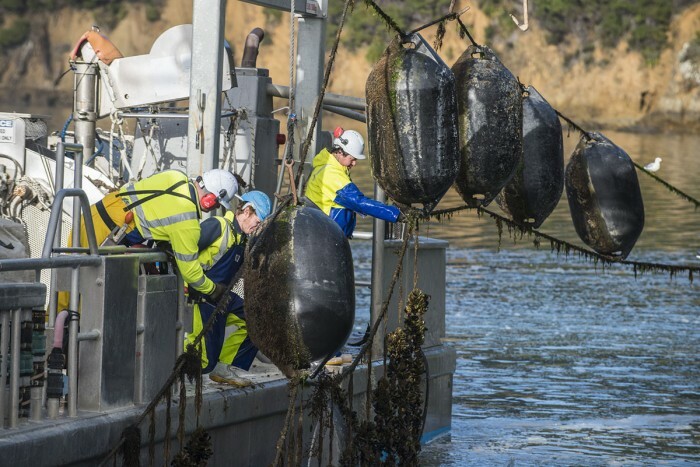 About 650 mussel farms, 230 oyster farms, and 11 salmon farms operate in New Zealand. New Zealand King Salmon, which operates farms in the Marlborough Sounds, and produces about two-thirds of the country's farmed salmon. Sanford, which has farms in Coromandel, Havelock, Kaitangata, and Stewart Island. Moana New Zealand, which operates oyster farms across the North Island and top of the South Island, a hatchery and nursery in Nelson, and a blue abalone farm in Ruakaka. A number of smaller businesses also operate throughout New Zealand. Boyd, D, floating and farm development manager, Sanford Limited, careers.govt.nz interview, March 2018. Burdass, M, aquaculture programme coordinator, Nelson Marlborough Institute of Technology, careers.govt.nz interview, June 2018. Jeffs, A, professor of marine science, University of Auckland, careers.govt.nz interview, June 2018. Moana New Zealand, careers.govt.nz interview, April 2018. Preece, M, chairperson, New Zealand Salmon Farmers Association, careers.govt.nz interview, March 2018. Aquaculture farmers may progress to work as managers or supervisors. With further training, they may also progress to become fishing skippers. Deckhands may take care of passengers and assist in the operation of vessels such as harbour ferries and charter boats, or cast and haul in nets, lines or pots, and process fish on inshore or deep-sea fishing vessels. Fishing skippers are responsible for running a fishing boat. Responsibilities range from navigating the vessel and organising the crew, to catching and processing fish.